Seems like you can never find anything in your kitchen pantry, regardless of what you’re looking for. You want to sweeten your coffee but you end up putting salt in it? You’re looking for parsley yet dill is the only thing you come across? And where are the measuring cups you wonder? The chaos raging in your kitchen is enough to bring you to tears? If you have answered positively to most of these questions maybe it’s time to start thinking of some pantry organisation. At least if you want your kitchen to look like something other than a battlefield… But hey, this task isn’t as scary as it sounds! On the contrary with these DIY kitchen pantry organising ideas it can actually be quite fun. Let us start at the beginning. Before you commence organising your pantry, you should clean it in detail for maximum freshness and tidiness, MainCleaners Ealing claim. Begin by emptying the shelves of all products, jars and boxes. Move your garbage bin next to the pantry so you can immediately dispose of everything useless or spoiled. Or if you have way too many canned goods, you can donate some of them. Then you can sprinkle all food stains with baking soda and once they soften, remove them with a spatula. When the shelves are finally clean, reline them with new contact paper. Everything is clean and neat and you can proceed to the next step. Now, this is of crucial importance if you wish to find the things you’re looking for. Everything should be put in its rightful place. For example the canned goods should be placed on one shelf, your spices – on another and so on. This way as soon as you open your pantry, you’ll know where to look for that can of beans. Another method for organisation is to divide it into sections, depending on how frequently you use certain products. Place the things you use every day on the middle shelf for easy access, those you use relatively often at a lower shelf and finally the ones you rarely touch at the top shelf. 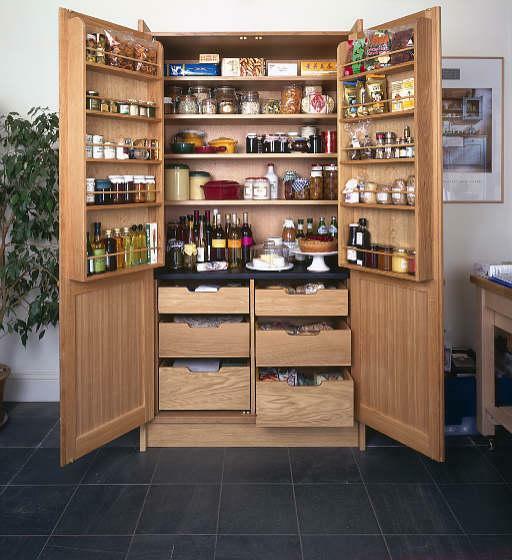 You can divide your pantry to as many sections you like though. Labels come in especially handy when spices and condiments are concerned. Why not make some yourself instead of buying labelled jars from the store? There’s an easy way to do that. If you’re not a Photoshop specialist you can download some cool printable labels off the internet and print them out. Then stick them on the respective jars. Or another idea – if you have kids, ask them to help you draw some of the spices on each label – chilli peppers, lumps of sugar, parsley. It would be much easier to find spices if you’re aided by the drawings. These containers are perfect for storing everything from fruit and vegetables to pasta, rice and even flour. Since they are see-through you can find what you’re looking for right away. They help food remain fresh and are compact as you can stack them one over the other. Our suggestion is to buy containers with charts telling you how much food you can fit in. This way you will notice as soon as you’re running out on something and go to the store to buy it before the container is completely empty. Make sure you stick some of your custom-made labels on each container. Apothecary jars are quite expensive but you can make some on your own to store your spices and condiments in. What you’ll need are some empty pickle jars, a few knobs of different sizes and shapes and some spray paint. Drill holes on the lids of the jars first, then using a screwdriver secure the knobs on the lids. Once done with that, you can use a can of spray paint to add a final touch on the knobs and lids. Silver or gold spray paints are the best option – your jars will look elegant and professionally crafted. You can store spices, candies and nuts in them. Try these advices and you will see there is enough room in the kitchen after all. Remember, no matter how small your kitchen may be there is always an adequate way to organise it so that there is a place for everything. Besides when good organisation is at hand, it would be much easier for you to find whatever you’re looking for. And you will no longer have to take your morning coffee with a pinch of salt. Thanks to Edna Thomson for this informative guest post and to all of you for reading! Hi Fae! I’m sorry for the slow reply …somehow I am just now seeing this! Doesn’t she have some cool ideas. 🙂 Thanks for stopping to comment!